The remarkable invention experimentally demonstrated by Louis Brennan - Will it prove successful in practical operations? With two rails and an ordinary steam locomotive, the practical limit of safe speed was reached years ago. Some trains on the New York Central and the Pennsylvania Railroad in this country, and on a few of the leading lines of France and England, have shown that a rate of sixty and even seventy miles an hour can be maintained for a considerable distance. But this speed demands a perfect road bed and a quite or very nearly straight track. No engine can take a curve of short radius at sixty miles an hour without being thrown from the rails. Hence, on most of the exist­ing lines, the speed problem demands some new device if trains are to be run with proper safety and in quicker time. To solve this problem, Mr. Louis Bren­nan, an engineer who was born in Ireland, spent his early life in Australia, and now lives in England, has brought forward a most ingenious and interesting mechanism. 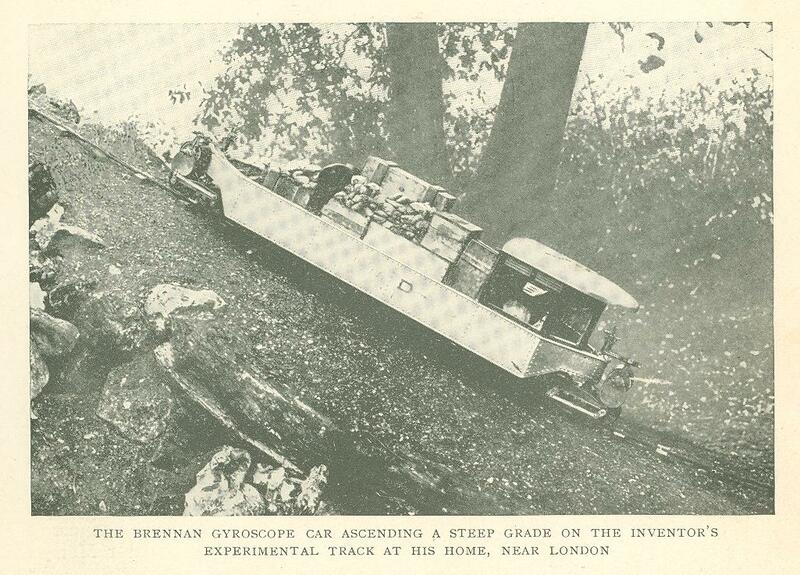 In May, Mr. Brennan gave an exhibition, before the Royal Society in London, of a new kind of railway. The experiment as­tounded those who saw it. A single track was laid around the amphitheater, and on this track a small car, about as large as the ordinary compartment in an English rail­way-carriage, was propelled by electricity at a surprising rate of speed. It rounded sharp corners without losing its equilibrium. When it was suddenly stopped, it stood immovable, upright, and with no oscillation. It was apparently impossible to upset the car; and no increase in speed affected its stability. The explanation of this astonishing phe­nomenon is a simple one to mathematicians, now that it has been explained by Mr. Bren­nan. It involves the application to railroading of what used to be a scientific toy known as the gyroscope, which was invented as far back as the seventeenth century, and which has interested physicists and engineers ever since that time. The gyroscope is a sort of top, consisting of a wheel revolving rapidly on an axis, which can be tipped over horizontally without falling, as if in defiance of gravity. As every boy knows, the faster a top spins the steadier is its balance. It is only when it revolves more slowly that it begins to oscillate. 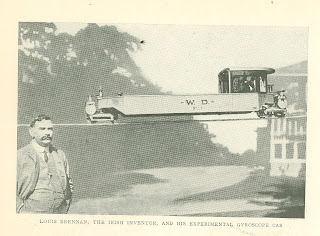 Mr. Brennan's gy­roscopic apparatus utilizes this principle by employing what may be called a double gy­roscope - two large wheels revolving with great rapidity in opposite directions in such a way that when one of them is depressed the other is depressed in precisely the oppo­site direction, thus securing an even balance. This imparts to the cars of the gyroscopic railway a steadiness so absolute that it can­not be disturbed. It is asserted that if two gyroscopic trains were to rush into each other head on, they would both leap from their single track; but even then - that is, presumably, if they were not irretrievably smashed - they would not be overturned, but would continue to run on over sleepers, rough ground, or any ordinary obstacle. Even if their wheels should be broken off, the carriages themselves would still remain in an upright position, and the passengers would suffer nothing worse than a sha­king up. It is plain enough that, should the mono­rail car prove to be practicable on a larger scale, it will revolutionize the railway sys­tems of the world. The question of speed is not the most important one involved, al­though even in the matter of speed the ap­parent possibilities of Mr. Brennan's in­vention are remarkable. He calculates that the rate attained by his trial car is equiva­lent to a speed of one hundred miles per hour for a full-sized motor; but a still more striking feature of the new system would be its enormous saving in the cost of rail­way construction. Each track would con­sist of a single rail instead of two, and it would be needless "to spend millions in the elimination of sharp curves and steep gra­dients. To cross rivers or ravines, it would not be necessary to build vast and costly bridges of masonry or steel. The Brennan car would require nothing but a light struc­ture, sufficient to support a single rail, which need be little more than a very substantial wire rope. 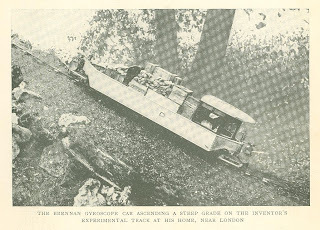 At the present time of writing, no full and scientific report of Mr. Brennan's ex­periment has been published; and American scientists are divided in opinion as to the feasibility of the gyroscope train. Their doubt mainly centers in the difficulty of pro­viding sufficient electric power on an ordi­nary car to keep the gyroscopes revolving at the high rate of speed which is necessary. This, however, is a practical problem which does not seem hopeless. Mr. Brennan, though not well known to the general public, long ago made a scien­tific reputation by inventing a self-steering torpedo, the secret of which he sold to the British government for a large sum, stated at more than half a million dollars. His new discovery is likely to be tested on a large scale before long, and for this test abundant capital will be at his command. When his trains are in actual operation, they may make our present railways seem as obsolete as the old-time stagecoach seems today.